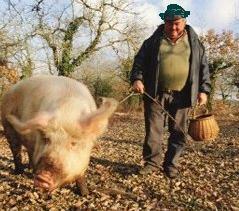 Farmer Brown: spot the O’Porky! Skilled yes, but the skill in question is the sort of skill no detectorist will explain to you in detail. Basic detecting comprises sweep / beep /dig, nothing else, a monkey could do it (no, that’s not offensive, it’s simply the truth) but the skill – the ONLY skill recreational detecting involves – lies in an ability to be selective about which beep to dig. Detectorists get quite good at it they say (and if they aren’t they can also switch their machines to “discrimination mode” to signal or exclude “undesirable” targets). That’s not archaeology or science. It’s the opposite. It’s artefact hunting (for personal or financial reasons) and hunting for a tiny subset of artefacts to boot. 99.9999% of artefacts are the “wrong” sort of metal or are non-metallic or broken or not saleable and are ignored or rejected so “context”, which is the essence of archaeology and knowledge and science is totally dismissed and very often distorted or destroyed – purely for reasons of personal acquisitiveness or financial gain. That’s the fundamental problem with recreational metal detecting, it’s selfish cherry picking of everyone else’s history and it’s why the Irish don’t allow it. All else you may be told is baloney. « A fun quiz question for NT Members and Staff!